“The French think differently,” said nearly every one of us who was not actually French. Of course, we said this to each other in French, so perhaps we were thinking differently too. 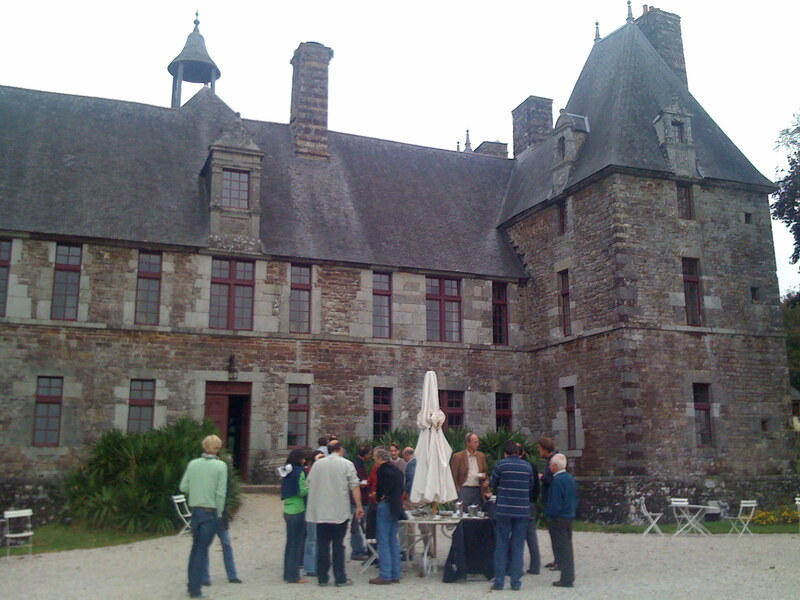 At Cerisy, for one week, 30-50 people live on the castle grounds and basically talk all day. This summer, the week-long “colloques” have apparently covered everything from the poetry of Rilke to the way science fiction affects the present day, to weightier social themes. Our colloquium, organized by researchers Nils Ferrand of the French institute Cenagref and Diana Mangalagiu of Reims Business School and Oxford University, was called “Changer pour Durer.” The word “durer” is the closest equivalent to “sustain” in French. Sustainable development, for example, is “développement durable,” which sounds like durable development in English. Which is pretty much what it sounds like in French, too. “Durer” also carries the meaning “endure”, but without the same level of slightly negative overtones. “To last” might be another cut at it. With all these inexact searching for translations, there appear to be good reasons that French researchers — like Swedish ones — sometimes just use the English word “sustainability”. Perhaps the word durable leaves a less-than-satisfying feeling in the mind. For to be satisfied in the mind, much as a good meal satisfies the palate, appeared to me a very French and lovely thing. Everyone takes a year of philosophy at the high school level in France, and philosophy is (by comparison to virtually any other Western country) astonishingly popular here. There is a popular philosophy magazine. There are hundreds of “Café Philo” meetings around the country, something like an open mike night for thinking, in local brasseries and coffee shops. Philosophers are almost nowhere in sight at most sustainable development seminars I attend; here, they were a major presence. It helped create the feeling that we were approaching familiar topics from an entirely different angle. Of course, inter-disciplinary dialogue among philosophers and scientists and practitioners and computer model-builders etc. is not an everyday occurrence anywhere, not even in France, and in this way the dialogue at Cerisy on change and sustainability felt rather unique. Ideas that were not new to me still somehow felt new, because they were being expressed in French, and because they were being challenged and questioned by people in disciplines (like philosophy) that are usually not represented in the other meetings I attend — not even the very multi-disciplinary ones like the Balaton Group. And there was a kind of clear and interesting tension, intellectually speaking, between the philosophers and the model-builders. The former essentially questioned the very premise of doing the latter — that is, building simplified models of the world using equations and computers. The model-builders seemed to think it was because the philosophers just did not understand what they were doing (“it’s as though they don’t *want* to understand” grumbled one scientist). The philosophers seemed to think the model-builders were remarkably and even naively uncritical of the potential impact of simplifying the world in this way, and then actually using the results to guide action in the world. It was not a tension that anyone tried to resolve; the French tradition emphasizes debate, not consensus. Good food and wine in the evening were the closest anyone came to a consensus. Then there was the art/science debate, which was less tense, and more filled with something like envy or desire. Rosa Casado, a Spanish performance artist, presented some of her work and some carefully sought-out thoughts about her approach to it. (“I don’t usually talk about my work, I usually just do it.”) The scientific model-builders admitted, in the “debate” which followed, that they were increasingly wondering if they were doing science or art these days — for example, when they worked on-site in Sénégal with local farmers and a very participatory process. There was a great deal of intuition and empathetic feeling that had to go into making such a project successful; did this make it less “scientific,” and more “artistic”? “I have to confess I just don’t know anymore,” admitted one researcher. Another polarity was around age, for this mostly middle-aged-to-elderly (at 49 I was at a sort of median) group of French-speaking thinkers was greatly enriched by the presence of a group of very engaged students or younger researchers. Why, these younger folks wondered in the evenings, are all these older folks speaking about the future so pessimistically? This, I heard from others, was very disconcerting to them since, after all, it was *their* future the older folks were talking about. For me, personally, the whole experience was enormously enriching. It was the first time I’d presented my work in French (a scary trial for me, probably a chore for the listeners, but a challenge in which I took enormous joy for some reason). The interest in things like the ISIS Method among these new colleagues was gratifying. But it was also the first time I was attending such a seminar, since I don’t know when, without having any organizational responsibilities. I could just sit, and listen, and learn, and think, and occasionally ask a question. What luxury. Oh, and one evening I was invited to play the guitar and perform my songs; it turns out that French-speaking professionals working on sustainability also like to hear English songs with titles like “Exponential Growth” and “Dead Planet Blues.” I brought out some new songs too, like “Damn the Discount Rate” and “Set the World Right Again,” both of which had never been heard outside of a Balaton Group meeting. And with help, I managed a translation of my song “Balaton” into French as well. In addition to the general learning and some improved French capacity, I came back with two new songs in the works (both in French), a huge new professional project clearly framing itself in my mind, a great deal of inspiration for my next book-writing project … and most importantly, some new friends and colleagues. I note that I have reported at length here on Cerisy, but have not even written a word yet about the annual Balaton Group meeting in Hungary a few weeks ago — which was also a terrific high point, the best meeting experience we’ve had in a few years perhaps. Many important things happened there. But at Balaton I have, as I note, organizational responsibilities. I have (and happily share now) the role of President, so my experiences and reflections are necessarily group-oriented ones to a large degree. At Cerisy, I could indulge myself, individually, as a mere participant-learner-listener-writer-singer. It was a like holiday for mind, with excellent company in a wonderful, stimulating environment. I felt “changed” in ways that will help me to “endure” as well — for we must endure if we are to keep making change. To the organizers of Changer pour Durer, Nils Ferrand and Diana Mangalagiu, I publicly extend my warmest gratitude.